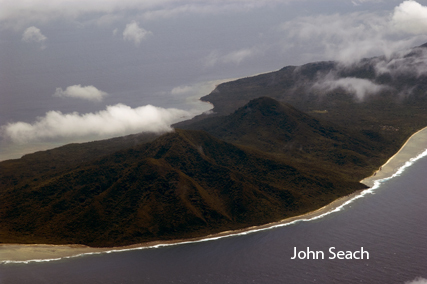 The submarine volcano Karua lies near the northern rim of the Kuwae caldera and is one of the most active volcanoes of Vanuatu. It occupies the area between Epi and Tongoa islands. Kuwae has been responsible for one of the largest eruption in the world over the last 10 000 years. The magnitude of the eruption of Kuwae was of similar to that of Crater Lake (USA) 6800 years ago. Tongoa Island forms the southern rim of Kuwae caldera. Islands have regularly formed in Kuwae caldera. An island had formed by 1901. It was 300 m long and 16 m high. It disappeared within 6 months. 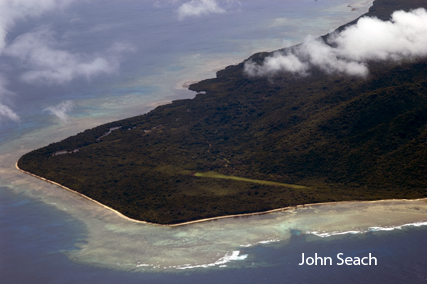 At the end of 1948 an island formed 1.4 km long and 100 m high. This island lasted one year. All the islands have disappeared due to possibly wave action or caldera floor movements. In September and October 1959 the island reappeared and attained a height of a banyan tree (about 6 m). A basaltic cone lies on the floor of Kuwae caldera with the summit just under the surface of the ocean. A small island emerged at the 1897, 1923, 1948, 1949 (2nd eruption), 1959, 1971, 1974 eruptions. Activity at present at Kuwae is confined to fumaroles which stain the water yellow at Karua volcano. Over the top of the volcano hydrogen sulphide bubbles reach the surface. A magnitude 6.8 earthquake hit under Kuwae volcano on 23rd January 2015. The focus was at a depth of 218 km. In 1452 there was an eruption with a VEI of 6. It was explosive from a flank vent and produced pyroclastic flows. The outline of the caldera can be seen by Epi, Tevala, Laika, Tongoa, and Fatumiali islands. Between 32 and 39 cubic km of rock were destroyed during the eruption. The eruption deposited 40-60 cm of tephra over epi island. The eruption of Kuwae darkened the sky over Constantinople (Istanbul) and coincided with a change in power of the city. In May 1453 the city of Constantinople lay besieged by the forces of Ottoman sultan Mehmet II, the moon went into a long and dark eclipse. 1980, 1979, 1974, 1973, 1972, 1971, 1970, 1959, 1958, 1953, 1952, 1949, 1948, 1923, 1879, 1452.